Having now lived outside the U.S. for nearly seven years, I am frequently asked by my friends back in the States if living outside the U.S. is safe. That prompts an internal chuckle that I find tough to stifle. I presume that those asking want to make a comparison to their perceived safety in the States. So, let’s first dispense with the boring statistics. Is it Safe to Live in Roatán? 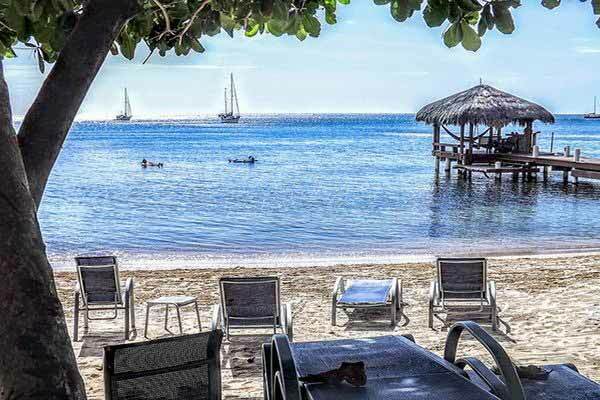 According to the Global Peace Index, the island of Roatan, as a part of Honduras, shares its ranking of 118 out of 163 countries analyzed. By comparison, the United States has a global safety ranking of 121. That puts Roatan/Honduras a few points ahead of the U.S. Iceland holds the number one rated position and Syria holds last place, ranked at 163. Now that we’ve established a frame of reference, here’s the scoop on Roatan. Roatan is a beautiful island about 40 miles off the coast of Honduras. And while Roatan’s safety rating is lumped in with mainland Honduras, Roatan is separate in geography, culture, and safety. While no separate safety or crime statistics are kept for Roatan, an abundance of evidence strongly suggests that Roatan is a world apart from its mainland connection to Honduras. It is, in fact, much safer than mainland Honduras and feels infinitely safer than the U.S., if for no other reason than the total absence of a gun culture. Further, there is no evidence of significant gang activity or violence on the island. Roatan’s economy is driven by a thriving tourist industry, propelled by its well-deserved reputation as a world class diving destination. Thousands of divers and snorkelers descend upon this magnificent little island every week, staying for a week or two and spending a healthy chunk of change for food, lodging, beverages and of course, diving excursions. The local government is well aware of the powerful economic impact these visitors have on the economy and maintains a strong, visible police presence on behalf of their guests. There are certainly crimes committed on Roatan and those crimes are on par with other booming tourist destinations across the globe. Crimes against property are the most common with petty theft being the leader. Leave your wallet wrapped in a blanket on the beach while you take a dip and chances are, it won’t be there when you return. Small cameras, jewelry, and expensive cell phones are things most often reported as stolen. Enjoying a few umbrella drinks at a local beach bar and forget to pick up your wallet or purse while you take a bathroom break and…well, you get the picture. With an almost total absence of guns and the purchase of ammunition being restricted and almost impossible to find, petty criminals are likely to have neither and rely on the inattention of tourists (many who may have had a few too many rum drinks) to make their living. But the strong police presence, timely intervention, and swift application of justice seem to be an adequate deterrent to keep crime low and criminals in line. The truth is that criminals look for easy targets. Be aware of your surroundings. Don’t flash a wad of bills or a wallet full of credit cards. Leave your Rolex and big diamonds at home and keep a low profile. This, by the way, applies to all travelers in all countries. Just maintain a low profile and avoid drinking to excess. Like every other community in all other countries, there are areas that are best avoided, especially at night. Roatan is a long, skinny island. The more touristy parts of the island (on the west end) are the most populated and there is safety in numbers. Sandy Bay, West End, and West Bay are the safest parts of the island. Avoid walking alone at night, or even on the beach with your loved one when darkness descends. Regardless of how romantic you may think it will be, there is nothing romantic about being mugged so why take a chance? Remember, many criminals are opportunists. Why provide the opportunity? When leaving your home or hotel, don’t take original copies of important documents (like passports) with you. Keep a copy in your purse or wallet and only take as much cash as you will need. Leave extra cash and credit/debit cards at home or locked securely in your hotel room. In addition to safety from crimes, there are other safety issues one may wish to consider. Is it Safe to Travel in Roatán? Transportation on Roatan can be a challenge as public transportation is a bit sketchy. Some enjoy renting motor scooters. Beware. A­t the time of this writing, the roads on Roatan are generally horrible, narrow with deep ruts, broken pavement, and large gaps where only sand and dirt exist. Falling off your motor scooter and collisions with other vehicles are a real possibility for the uninitiated. There are only a few street food vendors and with the abundant seafood available, typical of an island, many restaurants and beach bars offer a varied menu. Seafood ceviche is a common menu item and I happen to love it. But it is raw, marinated seafood so, use your own judgement. Finally, for those with existing medical issues, and especially those taking prescription medication, be sure you have an ample supply as local inventory of such things as insulin, blood pressure medication, and common antibiotics may not be readily available. The island offers one large public hospital, one fairly new private hospital and a number of small clinics. If your health requires frequent medical intervention, or even periodic interventions, Roatan’s medical services may be stretched to respond. In the end, you must decide for yourself what your definition of “safety” is and where your personal threshold is. While no place on the planet is completely safe I never felt in danger there and I would bet that Roatan will fall well within the personal safety range of nearly everyone.